Some call it the gay house. Some call it the LGBT office. But neither of those monikers cover the spectrum of whom the office wishes to serve. The Gay, Lesbian, Bisexual, Transgender Student Support Services Office is searching for a new name, one that better aligns with its mission to include all students. Within the first few weeks of class, the staff said it plans to begin calling for focus groups and sending surveys via the office’s email newsletter and social media, Office Supervisor Jamie Bartzel said. “We’re hoping to broaden the scope to reach both people who have utilized the office, who feel comfortable in the office, and those who don’t utilize the office, don’t know it’s here or look at it and think, oh, that’s not for me — especially those are the ones we want to reach and hear what they have to say and see if we can be better serving their needs,” Bartzel said. 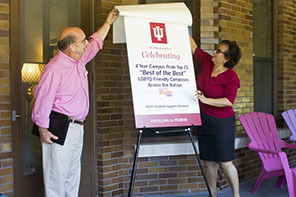 After the office changed its name to include the transgender community years ago and has long fielded questions about why the G comes before the L, the most recent discussion about a serious adjustment came after summer 2015 New Student Orientation. There, GLBTSSS Office staff handed out business cards with information on the front and a word cloud of identities on the back. Upon receiving the cards, many incoming students added terms on the back and drew arrows indicating a switch between “Gay” and “Lesbian” in the name on the front. “Seeing the cards with people’s notations on them made us realize we have to get serious about creating a name that’s welcoming for students and that students feel is representative of them,” Bartzel said. However, not everyone has been completely on board with past or impending changes, which could include an A for asexual and ally or a plus sign to denote absolute inclusion. Including allies is particularly important because some who identify as such are still figuring out their identities or aren’t comfortable coming out, Bartzel said. Bauder said he guesses the office will upset a few folks regardless of what it decides, but Bartzel said she disagrees. Other difficulties with the name change include logistics like replacing the sign in front of the house, updating websites and notifying other sites that link to the GLBTSSS Office. Despite challenges, the office staff said it is excited for the transition.